Elevated debt levels have profound implications for the global economy, ranging from growth to inflation to the level of interest rates (see e.g. Reinhart & Rogoff 2010, Aiyagari and Mccrattan 1998, Barro 1979, Eggertsson and Krugman 2010). High debt levels were a key ingredient in PIMCO’s New Neutral interest rate thesis, developed in 2014 (Clarida 2014). According to this framework, the global economy entered a new regime after the Global Crisis in which the equilibrium (i.e., neutral or natural) policy rates needed to ensure trend growth and at-target inflation would be much lower than their historical levels. In the US specifically, it was argued that the real neutral policy rate would likely be close to zero, implying a nominal rate close to 2%. High debt pushes down the neutral rate through several channels. It increases economic agents’ ex ante desire to save, given increased focus on debt reduction, it raises the economy’s sensitivity to monetary policy and in particular to interest rate increases, and it ties the hands of central banks, which need to take debt sustainability into account when setting monetary policy. In a recent update on the topic (Mai 2018), I argue that developments since 2014, if anything, have strengthened the case for considering debt as a constraint for interest rate increases ahead. In order to gauge developments in global debt, we review data from the BIS, which compiles data on a quarterly basis for more than 40 different economies, ensuring consistency in the approach for measuring debt across countries. 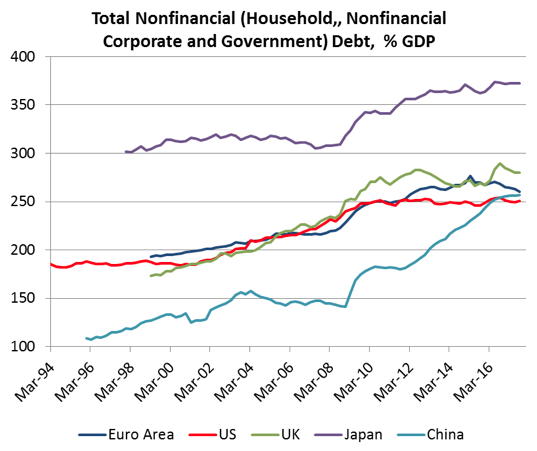 The main variables we focus on here are the total level of debt in the nonfinancial sector (comprising households, nonfinancial corporates, and government) and the level of private nonfinancial debt (comprising households and nonfinancial corporates), both measured as a share of GDP. Financial instruments included in debt measures are bank loans and debt securities (plus currency and deposits in the case of government debt). A review of these aggregates across regions reveals the following trends. Total nonfinancial debt (Figures 1 and 2) has kept rising globally in recent years, from just over 200% of global GDP in the years preceding 2008 to over 240% currently. 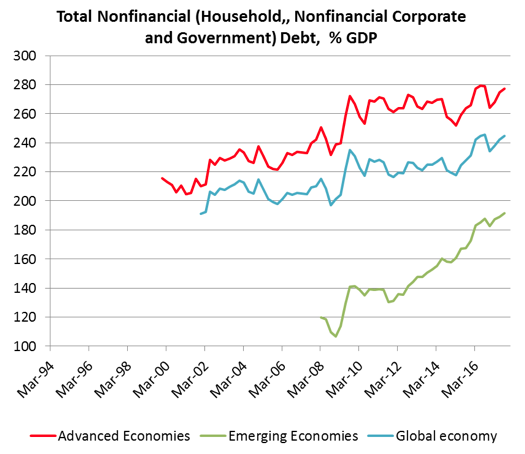 Debt increased across both developed market (DM) and emerging market (EM) economies, with the increase across EM countries proving particularly steep – from around 120% of GDP in 2008 to around 190% currently. The key driver of the rise in EM debt has been China, where total debt rose by a staggering 110% of GDP, from around 150% in 2008 to nearly 260% today. 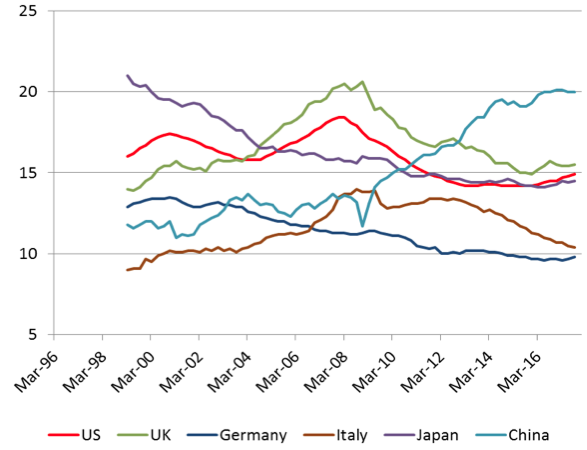 Across DM countries, debt has been rising across most major economic areas (euro area, Japan, UK), and has been broadly stable at a high level in the US. 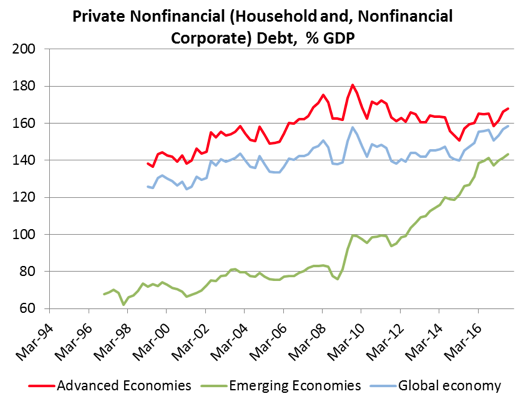 Private nonfinancial debt (Figures 3 and 4), an important aggregate when it comes to monetary policy transmission, has also risen globally at the margin, from around 140% of GDP in 2008 to nearly 160% currently. Private debt is rising steeply in EM countries (with China leading the way). 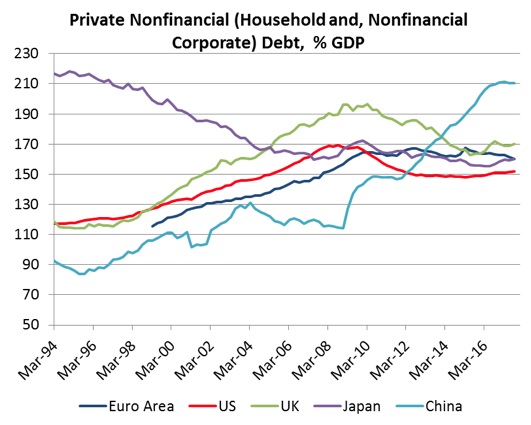 Within the DM complex, private debt has been reduced in the US and UK and remained largely stable at a high level across the euro area and Japan. Overall, not only has the debt overhang from the credit expansion in the run-up to the financial crisis not been corrected, but it has arguably gotten worse. This is not to say that there haven’t been pockets of improvement – there has been meaningful deleveraging in the US household sector, and progress in deleveraging across the private nonfinancial sector in the UK and in parts of the euro area. But debt overall (both total and private) has continued to rise globally, with a particularly steep increase seen in EM countries. An encouraging aspect to keep in mind is that debt service ratios (defined by the BIS as interest expenses and amortisations as a share of income) have generally come down across the DM in recent years. The fall in service ratios has been linked in part to the exceptional easing of monetary policy, alongside generally compressed credit spreads. While this development is positive overall for the health of the global economy, it is only a partial and contingent saving grace, for two reasons (see Figure 5). First, the picture is quite different across the EM complex, where private debt service ratios (calculated once again by the BIS) have been rising in several countries, most importantly in China. Second, the persistence of low debt service ratios is dependent on interest rates remaining low, making a return to ‘old normal’ levels very unlikely. As discussed above, one of the ways in which debt affects equilibrium policy rates is through central banks taking debt sustainability into account when setting monetary policy. To benchmark this view, we run a mathematical exercise to derive the average interest rate the government can afford to pay in future to keep government debt/GDP ratios stable at current levels. We do that using a simple debt dynamics equation (see Appendix below), using the following assumptions: the primary balance is unchanged going forward from its 2017 level (latest data available); real GDP growth and inflation move in line with trend (where trend estimates are PIMCO’s). Next, we convert the interest rate paid on debt into a policy rate by looking at the current spread between government bond yields with maturities in line with the current debt stock’s weighted average life (six years in the US, for example) and the current policy rate. This effectively assumes that the shape of the yield curve does not change going forward (note that a rise in term premia, which are currently very depressed, would further lower the level of policy rates required to stabilise debt). What we find is that average nominal borrowing rates consistent with a stable government debt/GDP ratio are 1.7% in the US, 2.3% in the UK, −0.7% in Japan, 5.5% in Germany, 1.3% in France, 3.2% in Italy and 2.2% in Spain (see Table 1 – these are average rates across existing maturities). When we translate these into nominal policy rates, central bank rates consistent with government debt stability are in the order of 1% in the US and the UK, −0.5% in Japan, 5% in Germany, 0.5% in France, 1.5% in Italy and 1% in Spain (for the euro area, there’s only one policy rate set by the ECB, and the weakest links should be considered most relevant in the analysis). Overall, the analysis suggests that policy rates need to remain very low to ensure that already high government debt/GDP ratios don’t increase further. Focusing on the US specifically, this analysis suggests the nominal policy rate consistent with debt stability needs to be around 1% in nominal terms, or −1% real. Interestingly, when we shock our exercise to include somewhat more optimistic macro assumptions (+1.0% on trend growth, +0.5% on trend inflation, and +1.0% on the primary balance – see Table 2), we find that the US policy rate consistent with debt stability increases but, at around 3% nominal and 1% real, it remains very low. This conclusion is similar for other countries, where rates consistent with stable government debt also remain low in the optimistic scenario. While this analysis is clearly partial in that it addresses only one aspect in which debt affects equilibrium rates (government debt sustainability), it highlights an important factor behind the need to keep rates low. The global economy remains highly levered, and sensitive to interest rate movements. Debt sustainability hinges on low debt service ratios, which in turn are predicated on persistently low interest rates. This will constrain central bank efforts to normalise rates and supports the thesis that global equilibrium interest rates have fallen. The persistence of low equilibrium interest rates has important implications for financial markets. US Treasury and German Bund yields can be volatile over the business cycle but, in a ‘new neutral’ world, duration valuations are likely to remain anchored. For risk assets, low equilibrium interest rates tend to boost these assets’ net present value as depressed long-term discount rates are applied on future cash flows. This would suggest that risk asset valuations in markets today may be less stretched than they appear at face value. Aiyagari, S, and E Mccrattan (1998), “The Optimum Quantity of Debt”, Journal of Monetary Economics 42(3): 447-469. Barrom R J (1979), “On the determination of public debt”, Journal of Political Economy 87(5): 940-971. Clarida, R (2014), “Navigating the New Neutral”, PIMCO, November. Eggertsson, G B, and P Krugman (2012), “Debt, deleveraging, and the liquidity trap”, Quarterly Journal of Economics 127(3): 1469-1513. Mai, N (2018), “Global Debt and the New Neutral”, PIMCO, May. Reinhart, C, and K Rogoff (2010), “Growth in a Time of Debt”, American Economic Review 100(2): 573-78. “Debt” is government debt/GDP (“Δ” being the change in this variable), “i” is the average nominal interest rate paid on debt, “g” is nominal GDP growth and “pb” is the government’s primary balance (i.e. the budget balance excluding interest payments) measured as a share of GDP. In the exercise, we then find the level of “i” that is required for “Δ debt” to be equal to zero.